Home / News / Temporary Exhibit: Whose Land Is This? 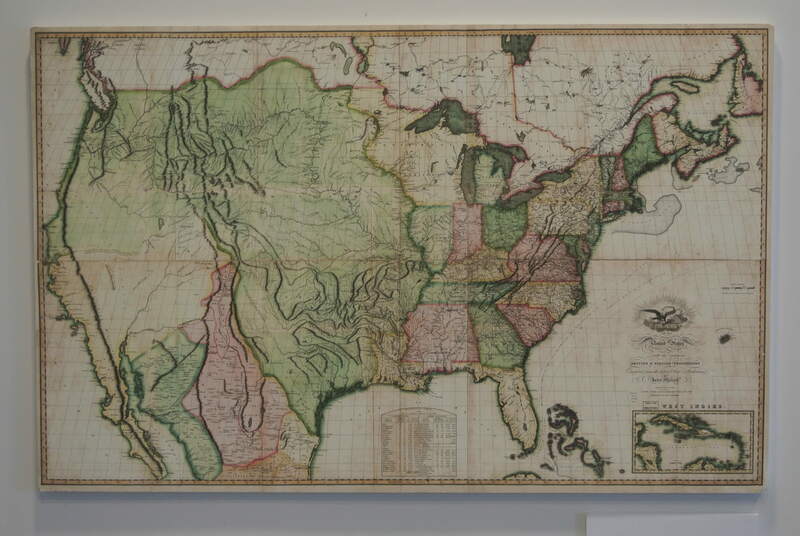 Pictured above: An 1816 map of the United States, along with nearby British and Spanish possessions. On display from Jan. 1 through March 31, this exhibit presents the history of public lands, beginning with the Ordinance of 1787. Other topics include the history of the General Land Office and the U.S. Grazing Service. In 1946, the General Land Office merged with the Grazing Service to create the Bureau of Land Management. “Whose Land Is This?” includes reproductions of historic maps and images of the United States, Nevada and Elko County. “From the Ordinance of 1787 to the creation of the Bureau of Land Management in 1946, the history of the public domain leads us to a deeper understanding and appreciation of our public lands,” said Supervisory Park Ranger Alex Rose. The exhibit is on loan from the National Historic Trails Interpretive Center (NHTIC) in Casper, Wyoming. “Whose Land is This?” was created by NHTIC Visitor Information Specialist Reid Miller.